Travel easily with everything you need with this 30" 7-pocket rolling duffel bag. 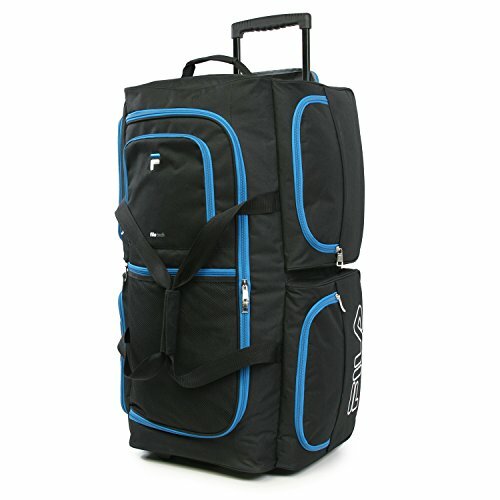 This rolling duffel from Fila provide a large amount of space for extended weekend trips. 7 pockets give you enough options to keep everything organized and easily accessible. Check-in size. 30" x 17" x 17"
VERSATILE USE - Use it for almost any situation--camping, business trips, road trips, study abroad, college, overseas travels. You name it! This bag has got you covered for all of life's adventures. BIG BUT NOT TOO BIG - At 30" in length, you'll be able to fit everything you need for a trip and some. It's lightweight so if you're traveling by air, it's easier to stay under the 50lb weight limit while staying worry-free. STAY ORGANIZED - The extra side compartments give you space to throw in those last minute items or lets you stay more organized if you're more of a planner.